A machete-wielding man has killed one and injured several others after going on the rampage through a German supermarket this afternoon. 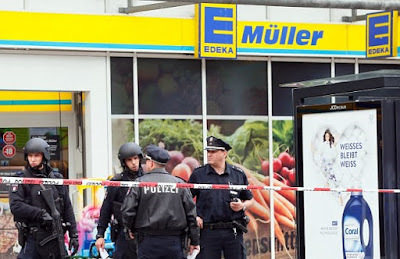 The attacker, who reportedly screamed Allahu Akbar, ran into an Edeka shop in the northern city of Hamburg and knifed a customer to death before slashing at four others as he fled. He ran off but was pursued by passers-by who wrestled him to the ground and called police who made an arrest. Heavily armed officers have locked the area down and police helicopters have been seen above the crime scene. A motive for the knifing has not yet been established. According to Bild, the man shouted 'Allahu Akbar' as he launched the attack in a branch of Edeka, Germany's largest supermarket chain.